I spent two nights in Galway while in Ireland; during the second day I took a day trip to Inis Mór, the largest of the Aran Islands. Accessible via a short ferry ride (about an hour long), the island is home to around 750-800 people, all of whom predominantly speak Gaelic. When I think about Inis Mór, the best description that pops into my mind is: the land that time forgot. With the ruins of old homes being overtaken by trees and shrubs, to the complete silence that is unescapable, Inis Mór seems like the perfect getaway for a week to run far away from any stress and troubles, yet too isolated to live in (at least for my liking!). Most of the group opted to rent bikes and ride out to an old fort near the cliffs; I decided to stay back and walk around the small island. If biking isn’t your forte, there are horse carriages to rent as well as locals who offer driving tours. Also on the island is a seal colony, but not much else in the area of entertainment. There IS a sweater shop, along with a sweater museum, however…. I was literally freezing my buns off. No joke. Which was the main reason why I chose not to rent a bike; I found a small pub and got loaded on cappuccinos. I would like to add, however, that they were the absolute best cappuccinos I had my entire time in Ireland, so I was a happy camper. After spending time near a fireplace in the pub, I wandered around the island a bit. There are heaps of abandoned homes; as I said earlier, some are overtaken by trees others depleted to ruins and roofless skeletons. Rusty iron gates, slightly opened to reveal a path into overgrown grass and boarded-up homes infested with chickens make for a somewhat creepy setting. 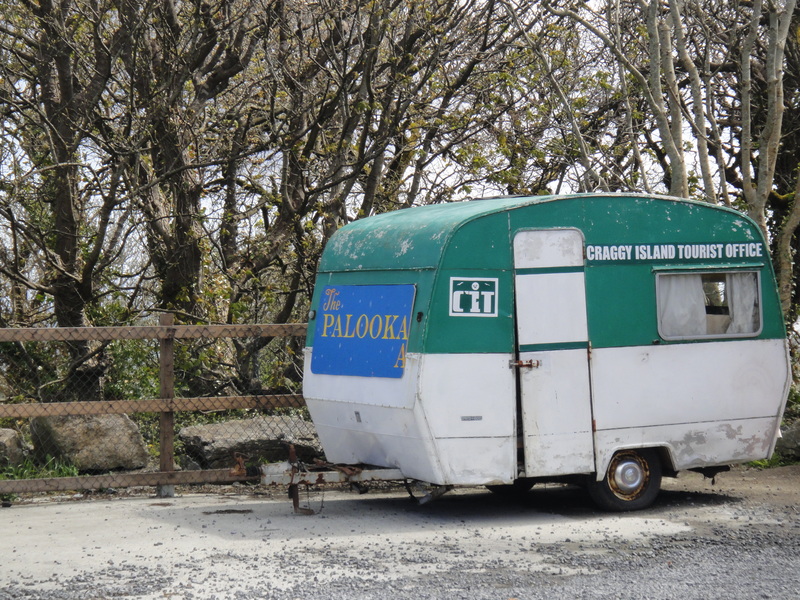 … On a closing note, the island is so small, THIS is their tourist office!…. 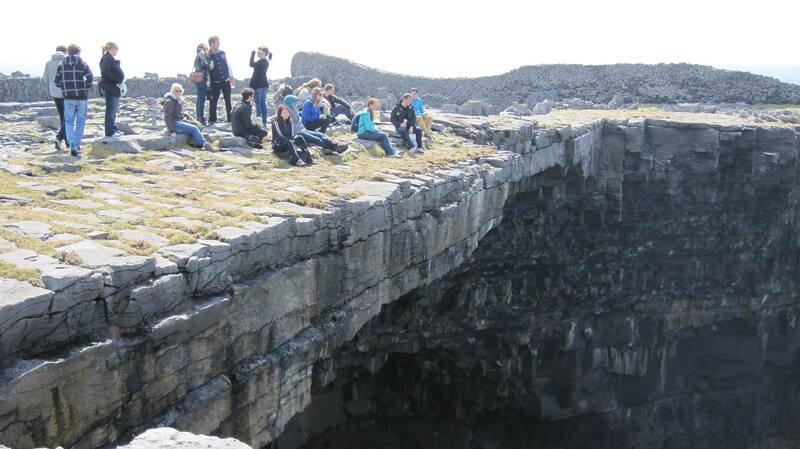 A HUGE thanks to Shamrocker Adventures for hosting my travels and allowing me to visit Inis Mór! All opinions, like always, are my own. Glad you’re going! I did the whole day trip. 1-6 isn’t long at all if you want to see the island. Plus, if you’re making the trek from Galway to the ferry, then the ferry ride, you should make it worth it! How long will you be in Galway for? So, I take it this is the island you’ll be running off to when you start writing the Great American (and/or Irish) Novel? No, no! I’d be able to stay there for about a week before I went nuts. It’s too quiet! And if the day ever came that I were to write a novel, I’d need to be submerged in a crazy, full-of-life type of city. I was that kid in high school that could only study with my Discman blasting in my ears (since it was way before the iPod was invented). The silence would make me useless! You could really stay for a month?!? I don’t know if I could last that long, but I’d totally be up for a week stay! I’d be constantly taking trips to Galway if I were there that long! How long did you stay for when you visited? If it were on some desert island where there was just a hammock and some rum and a palm tree and a hut and no one else (but mysteriously, enough food and water)? Not for a month, no. Not even for a week. For sure! I’ll keep that in mind, thanks! Cool post. I have been in the UK the last month travelling around and working. I am going to Ireland at the end of June for two weeks for my brothers wedding. Everyone I have talked to so far has said Ireland is the most beautiful place in the UK. Your post and pics do it justice. Can’t wait to go. Thanks! You’ll LOVE it! Are you traveling around the country or staying put in one area? Ireland is not the UK. Northern Ireland is; it even uses British pounds. Hey your photos are gorgeous! I enjoyed this today, thank you.